To reach the Grave of Christ or Kristo no Hakka as it is known locally, you need to head deep into the northern countryside of Japan, a place of paddy fields and apple orchards. Halfway up a remote mountain surrounded by a thicket of bamboo lies a mound of bare earth marked with a large wooden cross. Most visitors peer at the grave curiously and pose in front of the cross for a photograph before heading off for apple ice cream at the nearby cafe. But some pilgrims leave coins in front of the grave in thanks for answered prayers. The cross is a confusing symbol because according to the local legend, Jesus did not die at Calvary. His place was taken by one of his brothers, who for some reason is now buried by his side in Japan. The story goes that after escaping Jerusalem, Jesus made his way across Russia and Siberia to Aomori in the far north of Japan where he became a rice farmer, married, had a family and died peacefully at the age of 114. A villager hinted that I might be able to meet one of Jesus' descendents - a Mr Sajiro Sawaguchi, who is now in his 80s. His family owns the land on which the grave stands and his house is at the foot of the mountain. I set off to find him but was told he was too ill to speak to me. However, his grandson Junichiro Sawaguchi did agree to talk. Was I about to meet someone with a true touch of the divine? The tubby middle-aged gentleman in glasses who spoke to me did not seem particularly Messianic. "Actually, my family are Buddhists not Christians," said Mr Sawaguchi. "And I don't claim to be a descendent of Jesus although I know some people have said my grandfather is connected to the legend. However, when I was a young child, my mother drew the sign of a cross upon my forehead as a symbol of good fortune," he told me. Certainly the cross has brought good fortune to the villagers, who make money from the visitors and the media who seek out the grave. It has become the region's only internationally recognised tourist attraction. However the legend of Jesus the rice farmer does not stretch back very far. It only began in the 1930s with the discovery of what were claimed to be ancient Hebrew documents detailing Jesus' life and death in Japan. Those documents have now mysteriously disappeared and the grave has never been excavated. I asked a village official, Masaoki Sato, if he realised that the grave might cause offence to Christians who believe in Jesus' crucifixion and resurrection. "We're not saying that the story is true or what is written in the Bible is wrong," he politely explained. "All we are saying is that this is a very interesting old legend. It's up to the people who come here to decide how they interpret it." Many Japanese find it hard to make sense of Christianity. Schools are banned from teaching any religion and people are generally more interested in ritual and tradition than theology. However, Christian-style weddings are enormously popular. They are often held in hotels which have special chapels, complete with crosses and stained glass windows. 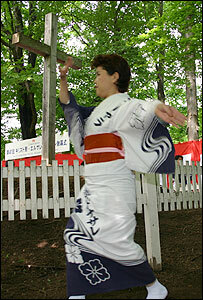 Foreign students are sometimes hired to play the part of the priest, although the whole event has no official sanction from any church. Churchy-looking buildings have other entertainment purposes too. In the city of Nagoya, I went to a theme restaurant where diners could choose either to have dinner in the chapel, seated on pews and surrounded by paintings of Jesus and the saints, or on the floor below, which is decorated like a prison, complete with metal bars around each table. Only 1% of Japan is officially Christian. However, there are some lively churches, such as the New Life Ministry in Tokyo. When I arrived on Sunday afternoon it was packed with young worshippers, clapping along to songs of praise and raising their hands in joy. I met Pastor Shintaro Watanabe, who was dressed in a floral Hawaiian shirt and had an almost permanent smile on his face. Wasn't he shocked by the legend of Jesus' grave? He laughed and said it was just a silly story which caused him no particular offence. "I suppose that many Japanese people feel respect for Jesus and the Bible," said the pastor. "The legend ties in with that. Perhaps it shows that people are looking to make a connection with Jesus in some way." His church is trying to satisfy that spiritual curiosity, just as countless missionaries to Japan have attempted before. Yet many Christians have discovered that the Japanese view of religion can be rather baffling - as the grave of Christ the rice farmer reveals. 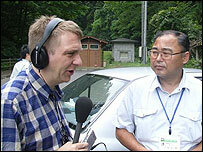 From Our Own Correspondent was broadcast on Saturday, 9 September, 2006 at 1130 BST on BBC Radio 4. Please check the programme schedules for World Service transmission times.